Foundational Learning refers to the competence needed in the low key areas of Communication and Mathematical Literacy in order to deal successfully with any learning at NQF Levels 2-4. It is a part qualification registered at NQF Level 2, SAQA 88895, and carries 40 credits in total. Each learning area carries 20 credits. The focus in Foundational Communication is on developing reading, writing, speaking and listening skills that will enable the learner to function optimally in the workplace, to enable the learner to deal with further learning, and to access training materials and related assessments. The focus in Foundational Mathematical Literacy is on using, and responding to, mathematical ideas and applications in an all learning content and the application of knowledge at different levels of complexity. FLC is aimed at learners registered on the NQF at level 2, 3 and 4. It is a compulsory component for all new qualifications developed by the Quality Council for Trades and Occupations (QCTO) at NQF levels 3 and 4. On Site Learning guides, assessment guides and fully equipped passionate facilitators are provided for you. Personal Training is face-to-face, classroom based for the most effective, individualised learning experience. Accessible Classes are scheduled to suit the client’s shift/production requirements. The venues for classes need minimal equipment. What are the benefits of FLC? Familiarises learners with the English writing skills that they will be expected to cope with in the workplace and in training material. Helps your employees gain access to, and process, technical and workplace wording. Establishes a sound basis for communication and training in your business. How does FLC fit in with the other programmes? The learner should be competent in AET Level 4 English and Mathematical Literacy before they can commence with FLC. FLC is specifically designed for AET 4 (NQF 1) learners and also for current employees who wish to improve their basic skills. Triple E Training’s products are aligned to the National Qualifications Framework (NQF). The NQF is a framework on which standards and qualifications, agreed to by education and training stakeholders throughout the country, are registered. The NQF is a means for transforming education and training in South Africa. 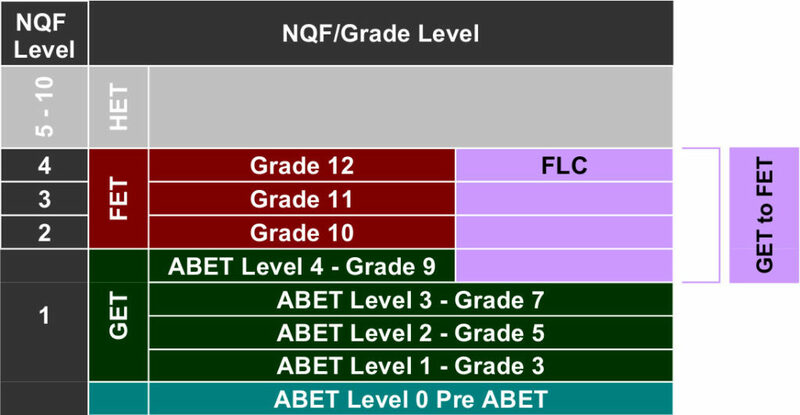 Where does FLC fit into the NQF?